What is Making Tax Digital and how will it affect me? Making Tax Digital – better known as MTD – is the Government’s plan to make it easier for individuals and businesses to know what tax they have to pay before the end of the tax year. Eventually, all businesses regardless of size and industry will be required to submit monthly figures to HMRC. This will need to be done on Making Tax Digital (MTD) compatible software. So, anyone still using cashbooks, Excel or desktop accounting software such as older versions of SAGE 50, will need to move onto compatible cloud-based accounting software. How will Making Tax Digital (MTD) work? Everyone will have their own digital tax account that they can log into and check to ensure all the information HMRC hold on them is up to date and correct. HMRC will then use this information to ensure that each person is receiving all the services they should be. The theory is that by the end of 2020, customers will be able to see all their tax liabilities and benefits in one place. How will Making Tax Digital affect my bookkeeping? All businesses will have to use a software that is compatible with HMRC’s MTD software to keep their accounts – like QuickBooks Online for example. The software will send the necessary information to HMRC using an API key. All transactions in a business will have to be recorded digitally as paper records will no longer be accepted as meeting the legal requirements. When will I need to be ready for Making Tax Digital? At this point in time, only VAT registered businesses with a turnover above the VAT threshold of £85,000 will need to be compliant as of April 2019 and they only need to file their VAT returns. Eventually, all businesses within the UK will be required to file all information – including self-assessments and corporation tax returns – with HMRC using MTD compliant software. When will Making Tax Digital start? As further information is released by HMRC we will update our clients so that they are able to be compliant in time. Currently bookkeeping clients of Ihelm Enterprises are one step ahead as we only use QuickBooks Online to maintain accounts and the software is MTD compliant. 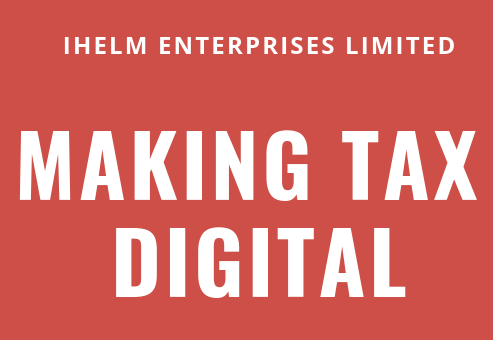 If you would like to discuss how we can help you with your accounts and become MTD compliant please contact us on info@ihelm-enterprises.co.uk or use the contact form.